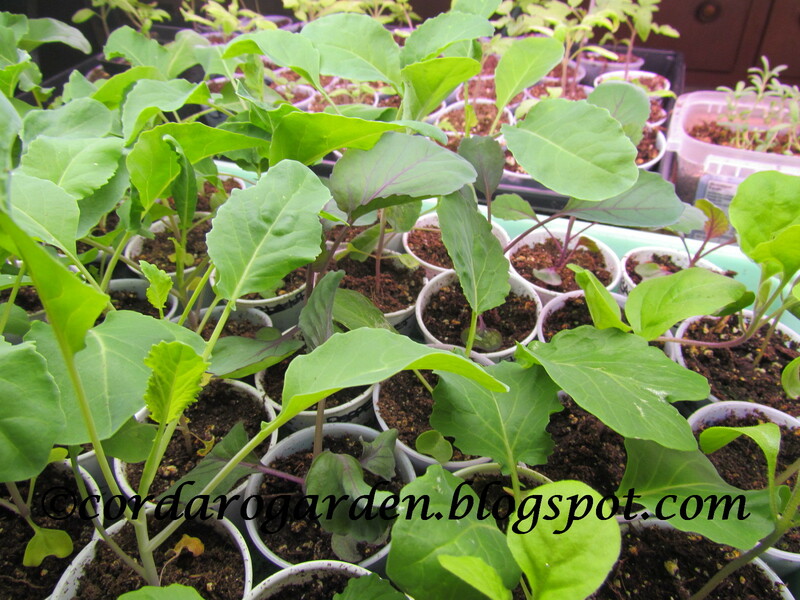 This is a journal of my small organic urban kitchen garden & large community garden plots. 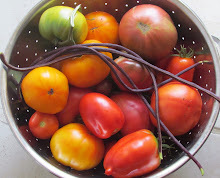 This blog includes home preserving, recipes & a little bit of our life. My husband calls the gardens Eden. He should know he is the cook here! We are located in eastern Pennsylvania in zone 6B. Wow, I can't believe it's mid-April already and that I haven't posted in a month! I have been reading a lot of blogs though. It's just been very busy with work, life and the garden. The cold weather and then the hot dry weather has passed and the weather has turned to normal for this time of the year. So.....I finally managed to get the home garden cleaned up this weekend. 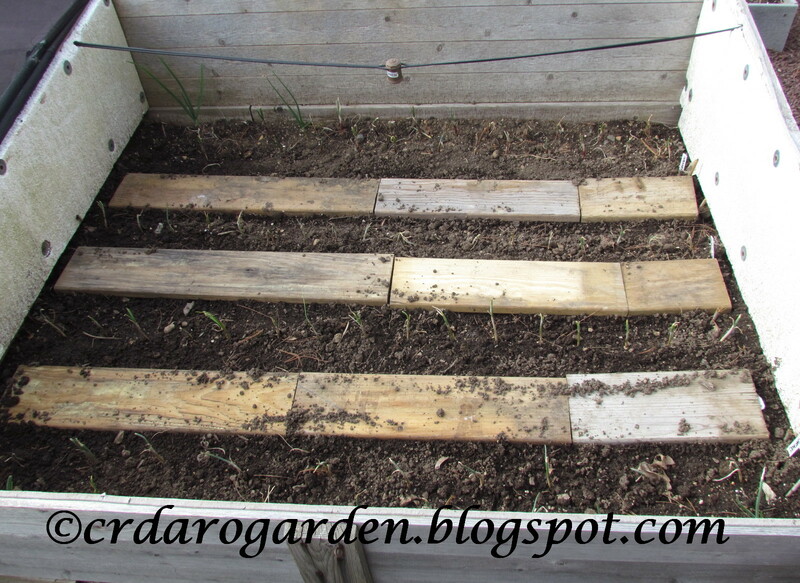 is planted with onions and carrots under the boards. I use Granny's Seed Mat Method.It works great! 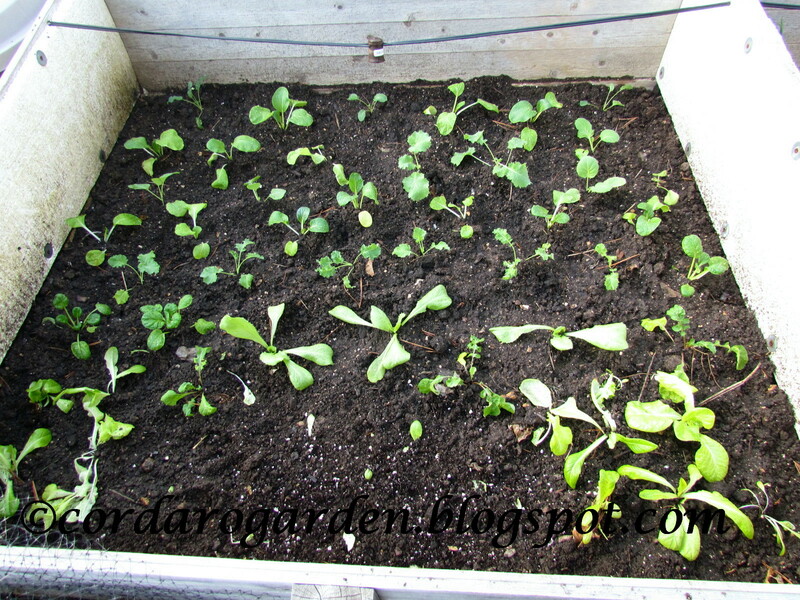 The over-wintered Spinach is really taking off! "The Italian" sautéed it with olive oil and garlic....yum! 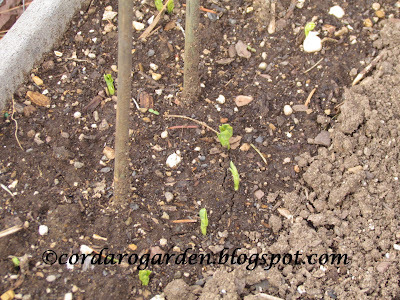 The Peas finally sprouted after our rain this past week! They're all popping through the ground! I usually plant my early Tomatoes in this bed. 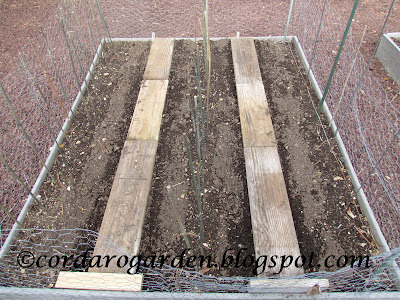 This year I sowed 2 rows of Little Marvel Peas and 2 rows of Carrots. 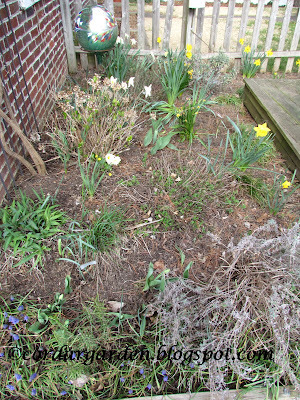 The Herb Garden has been cleaned out. It was a mess from that Sandy blowing through here last fall! The Rosemary made it through the winter for the first time! Lots of Happy Daffodils in the Herb Garden too! 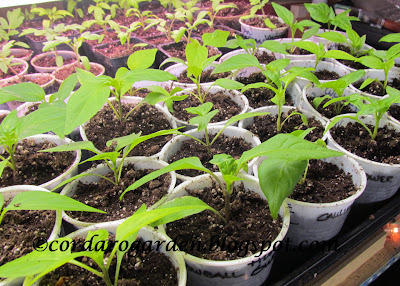 They will be a nice size when it's time to plant them out. 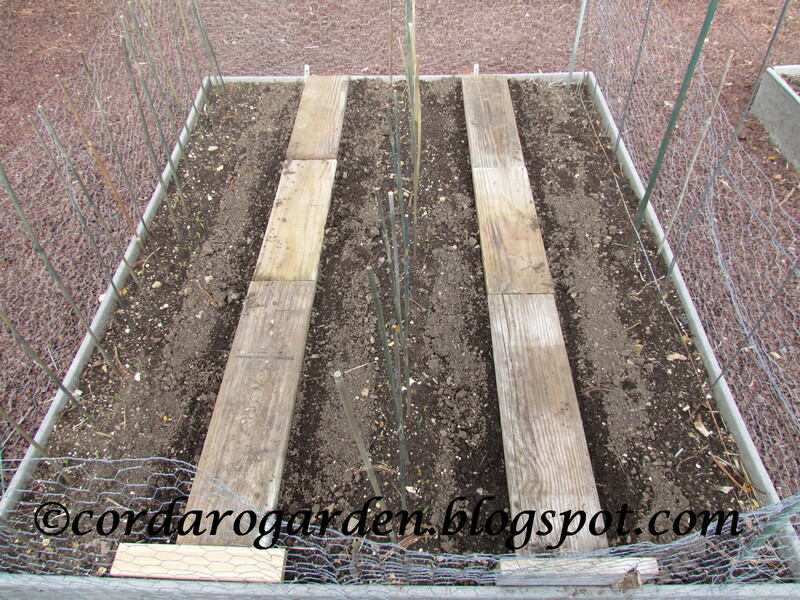 The Broccoli has already be planted at the plots. I'll post on the plots tomorrow. So, how's your garden coming along??? 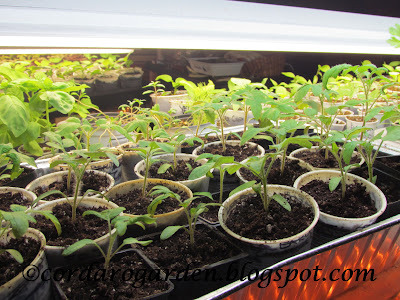 Do you think you're going to have enough tomato plants this year? 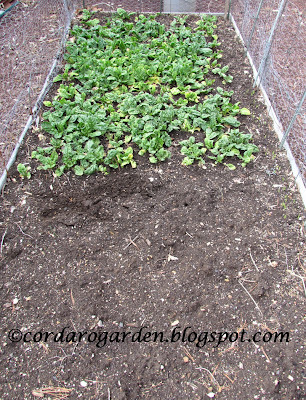 All of your seedlings look great, and hooray for peas sprouting. I think I had three shelling peas show up from probably 100 seeds sown. I'm beginning to lose hope for further germination. Luckily the sugar snaps are doing just fine. I planted those peas 3 weeks ago. The soil was so so dry that they didn't sprout until we had a good rain. Maybe you need to re-sow your peas. 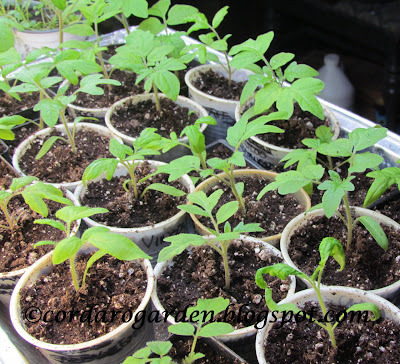 A couple of years ago most of mine rotted from too much rain and I had to re-sow them. 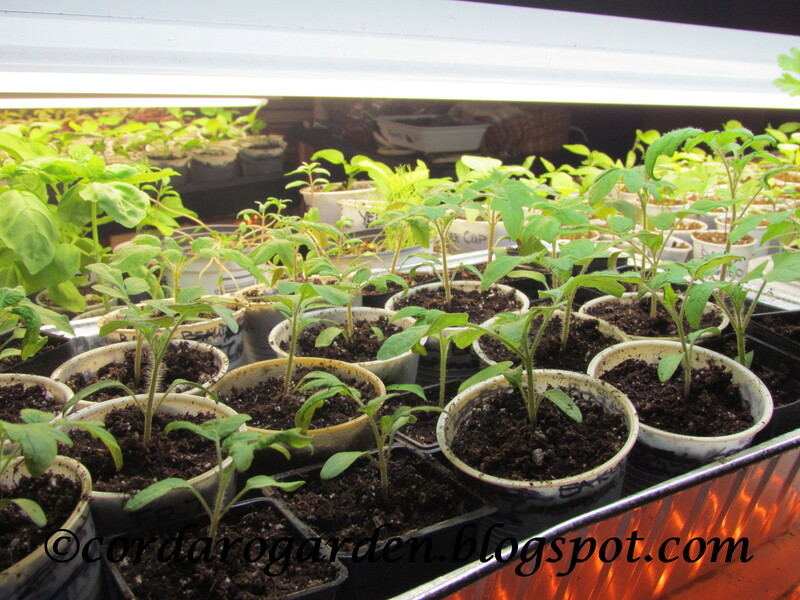 Yes, I think we will be fine in the tomato department this year! I also grow them for other people. To date, I think I have about 15 extras. Those will be given to others at the plots. Laura, overwintering is the only way I am successful at growing spinach. Hopefully, I will be freezing some soon! I know what you mean about being too busy to blog! Good to see your update!! 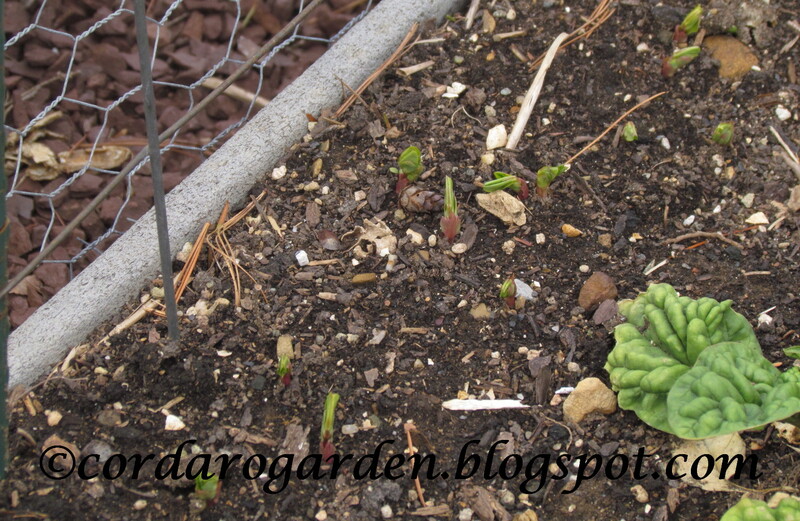 Hooray for overwintered surprises!! Thanks Holly! 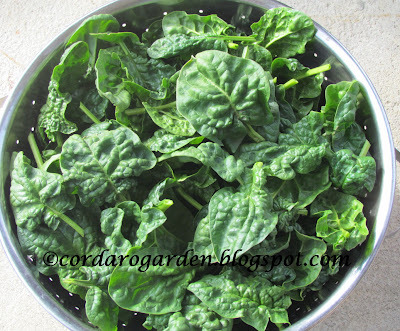 It looks like we should have a good spinach harvest! Wow! Envious of you spinach-we can't seem to grow the stuff here. Hi Alison, I was never successful at growing it either. 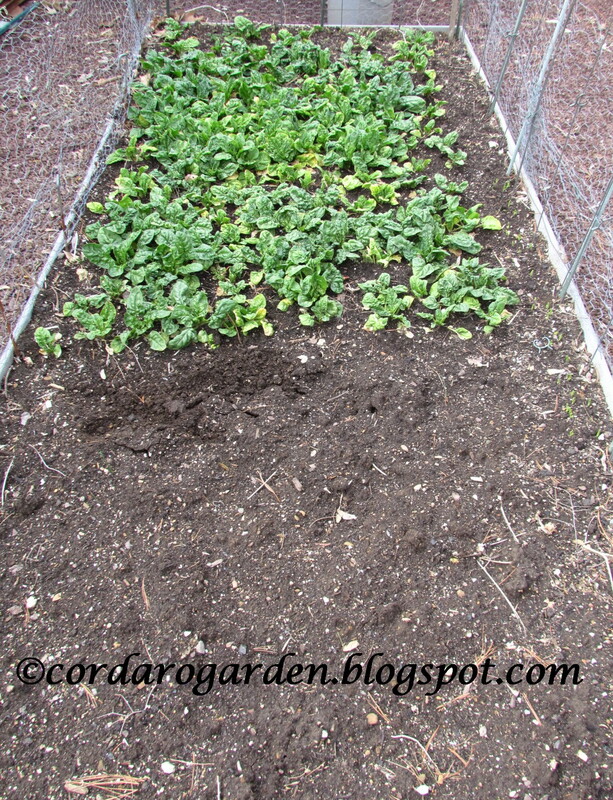 One fall, out of frustration, I threw a bunch of seeds in the ground....and the next spring we had spinach! That's the only way I am successful at growing it! Way too much celery? I bet with all those plants ours would fail to develop edible parts but we are trying yet again. Sue, I have had pretty good success growing celery. Maybe you need to try a different variety. I think I was lucky in choosing the correct variety the first time I tried growing it. I grow Golden Self-Blanching. This year I planted another variety also. We shall see if the reason I've been successful is the variety I have been growing or not. Good Luck! Too much celery? Is there such a thing??? 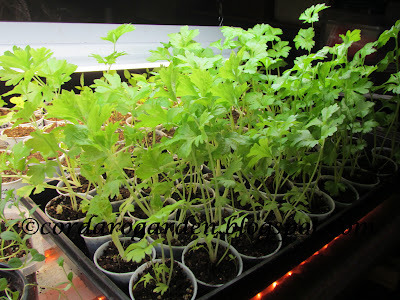 Your seedlings look so "stocky" and healthy. Mine always get spindly. 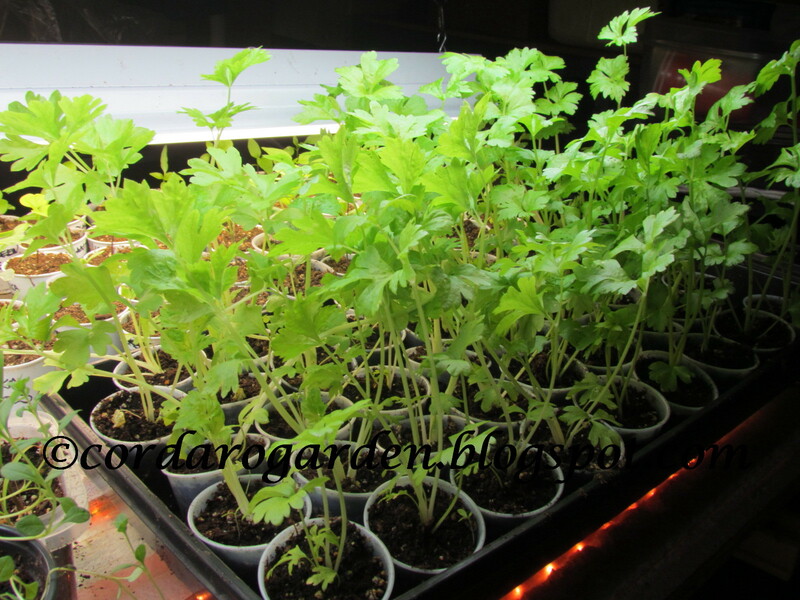 Sue, last year I harvest 17 lbs of celery! I gave some away and froze quite a bit. I think we are down to just a couple of packages left. I thought it was way too much...but, I guess not! Good luck with yours this year! 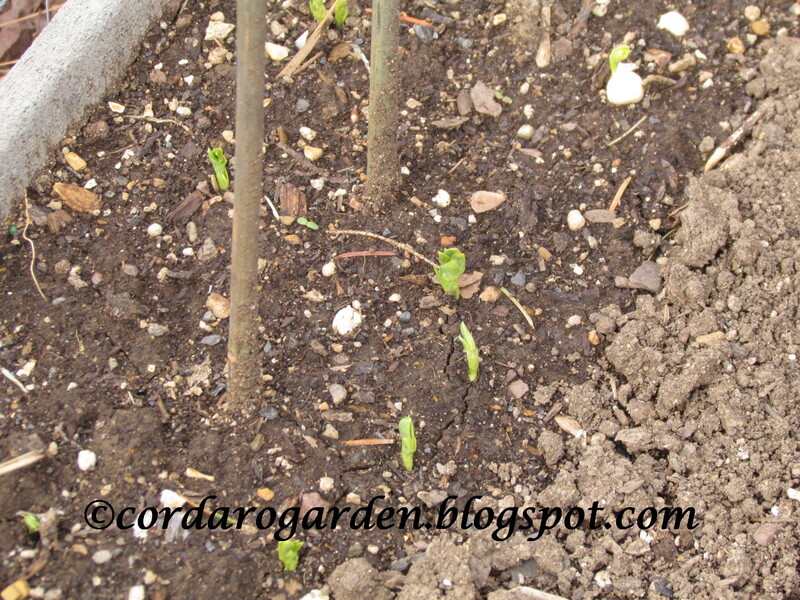 My peas are just starting to come up too. 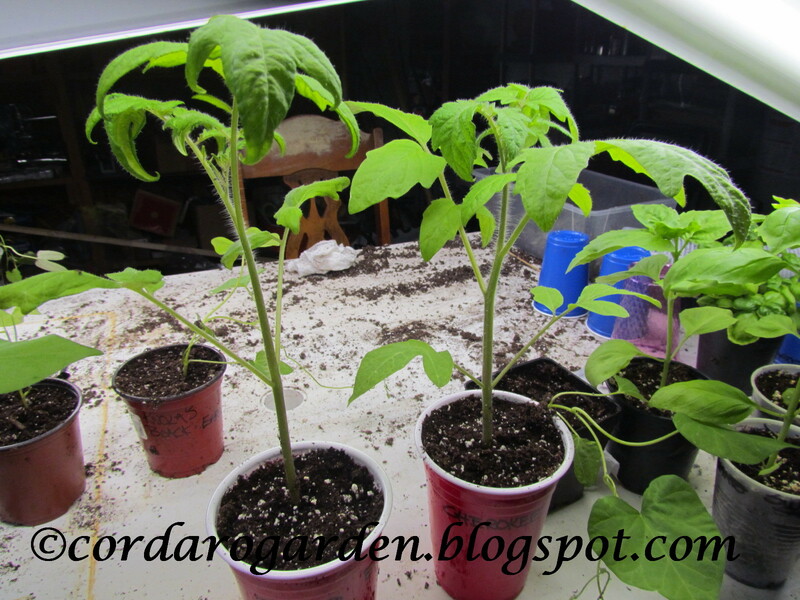 It was so dry before last week.I was wondering if I would have to resow. Daphne, I couldn't get over how dry the soil was this spring. I guess we needed more snow over the winter! yay nice to see a post from you! Everything is looking great!!! Thanks Mrs.P! I've just been so busy with everything! Life has a way of getting Busy! great post with all those healthy seedlings and lovely surprise for you with the overwintered spinach, love the way The Italian cooked it. We have experienced a really dry,hot summer(good for peppers/eggplants) and now into a very dry Autumn so no seeds or seedlings planted out yet. Yes Andrea, life sure does have a way of getting busy! We have been enjoying ourselves though! I'm very pleased with the spinach. Hopefully you'll get some much needed rain and you can plant out some fall veggies. Nancy, Granny's seed mats work great! I have been using them for a few years now. 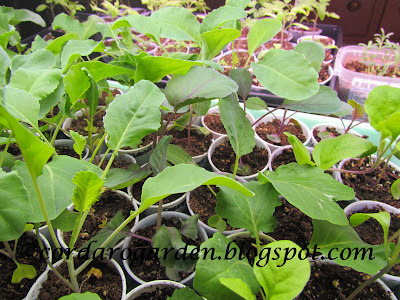 Most of those seedling starts have homes at the plots or for others. I sure hope your peas start popping! that's a lot of seedlings and they look great! Thanks Erin! It's a lot to tend to. I'm always happy when they are in the ground! Duvar kağıdı modelleri, çocuk odası genç odası duvar kağıdı italyan ve klasik duvar kağıdı çeşitleri. Thanks for visiting my blog and leaving a comment! © All materials on this site are protected by US copyright law and may not be reproduced for commercial purposes without my permission. 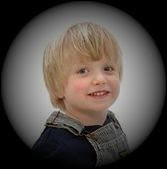 Please include a link to this site for all noncommercial uses.